The Japanese auto major has come up with Chrome edition of one of its successful MPV model. To trust the records of the auto industry, Toyota Innova has sold over 4 lakh units in India, since its inception. This particular model was launched in the year of 2005, and to mark this occasion, company decided to launch its chrome edition car. Toyota cars are received well in India, thereby are running high in Indian auto market. The Japanese auto technology implemented in its vehicles is well known in the world, and have been rated very well. This special edition model is launched with a chrome kit, which is generally an accessory pack, charged some extra amount of Rs. 31, 000. This chrome edition is available with every Toyota dealer across India. A Few highlights of the car covers, this being very fuel efficient MPV, offers smooth ride, high on comfort and versatility aspects. Toyota Innova Price is as such fixed in the price bracket of Rs. 9.51-14.47 lakh, while the special chrome edition Innova will be available in some more amount. This chrome kit is available with GX trim, some car accessories could be installed on top variants like including the VX models. The additions to this model includes, wheel arch moulding, muffler cutter, door handle and turn indicators. The MPV segment is expanding day after day, and the major reason being people are inclining towards it due to the comfort features, which come packed in with these kinds. This 8 seater wagon is available with both petrol and diesel options. Toyota Innova features a 2.0 litre petrol mill, which is capable of churning power of 132PS and top torque of 181 Nm. To make available wide range of choices, this car comes in twelve different variants. 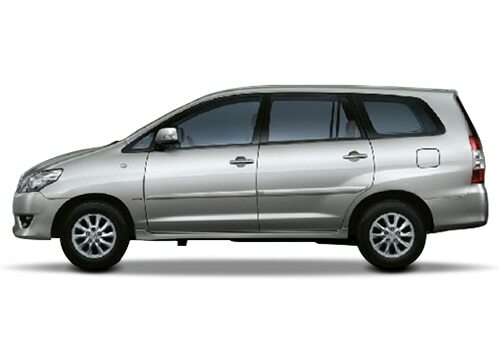 Toyota Innova Pictures exteriors which are spruced up with special edition, chrome model. One of the most stylish, premium MPV which has received very positive response of the market. The large sized wind shield, V-shaped bonnet and angular headlamps makes it look sturdy. It is one of those utility vehicle which has delivered the required purpose covering all other aspects. Talking about the comfort level, it is very comfortable, and suitable for long journeys. Moving to the interiors of the car, there are multiple luxurious features available in this MPV. Even it is very spacious and airy, makes it a perfect car for big families. All other aesthetic features are also taken care off and Toyota also added some new innovative and creatove features in Toyota Innova for better performance.